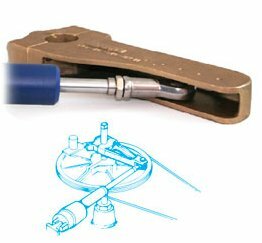 Edson Autopilot Tiller Arms are available in Bronze and Anodized Aluminum. Bronze is used for cruising boats and boats with stainless or bronze rudderposts. Aluminum is used for racing boats or boats with aluminum or composite rudderposts. Edson Tiller Arms are available in Bronze and Anodized Aluminum. Bronze is used for ..